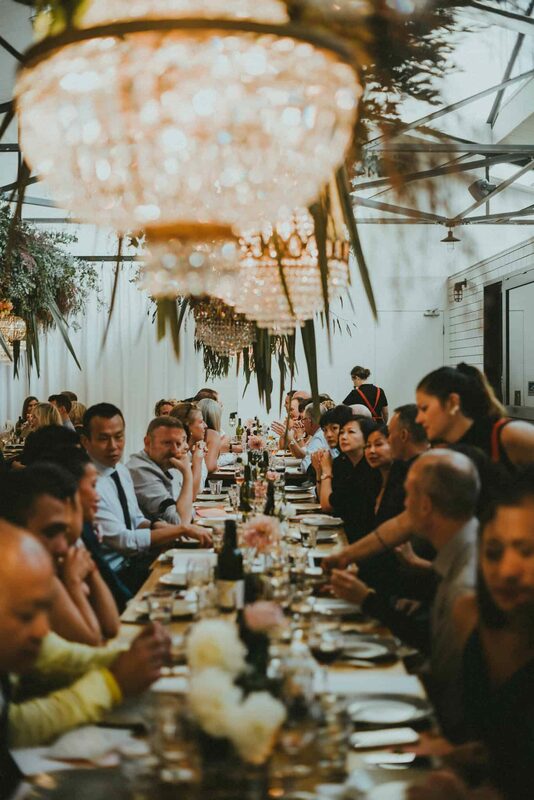 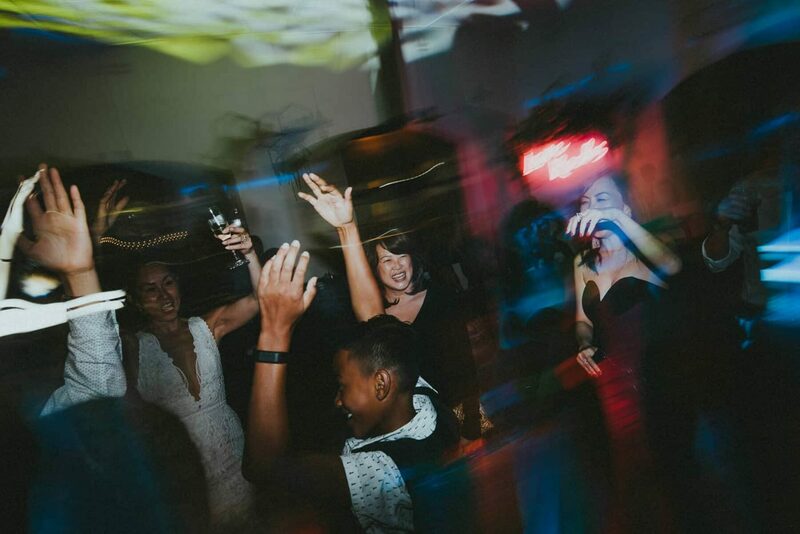 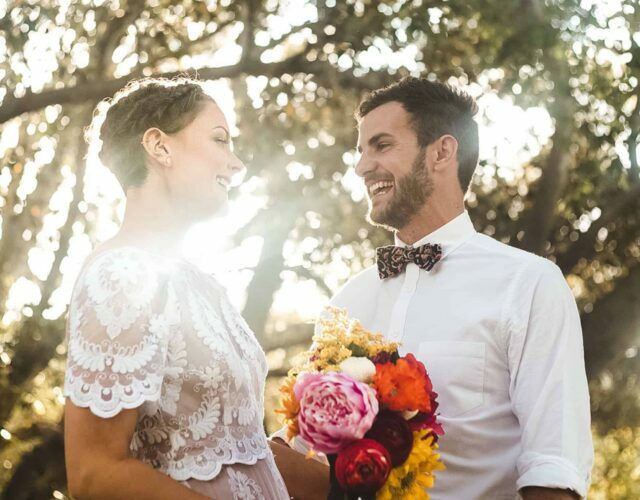 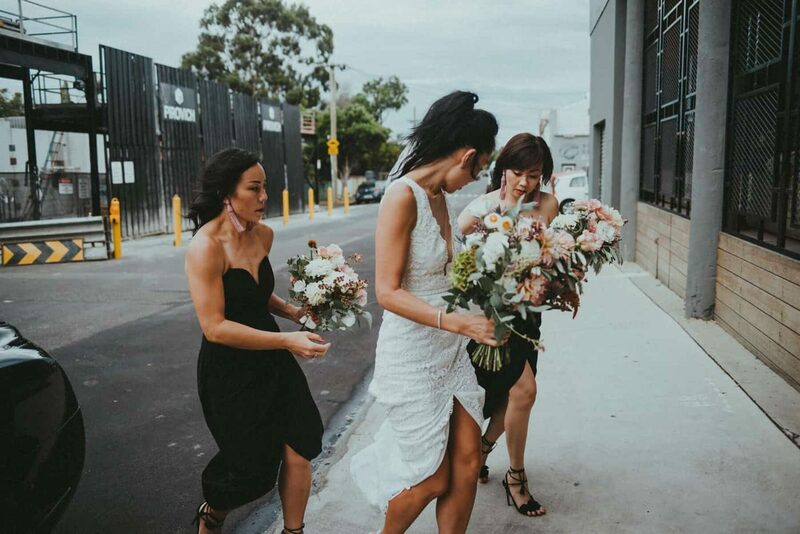 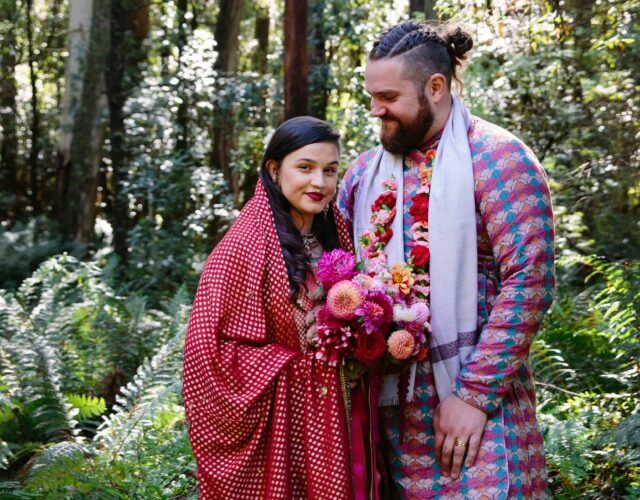 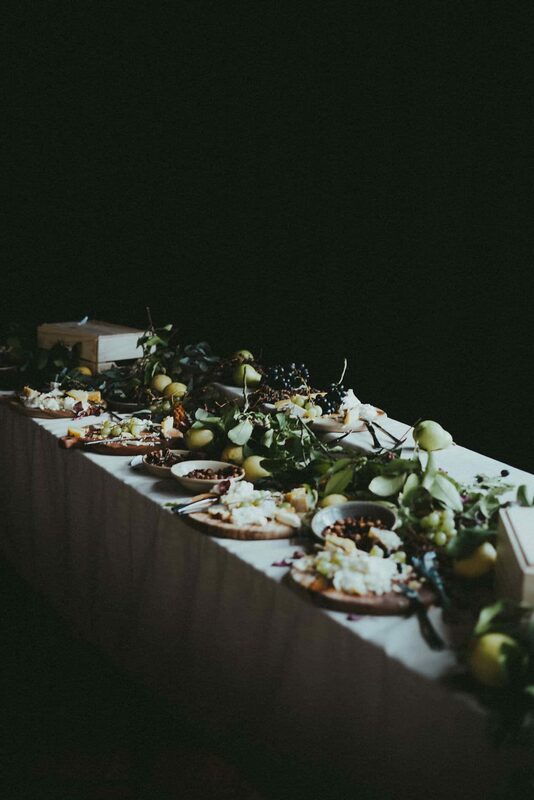 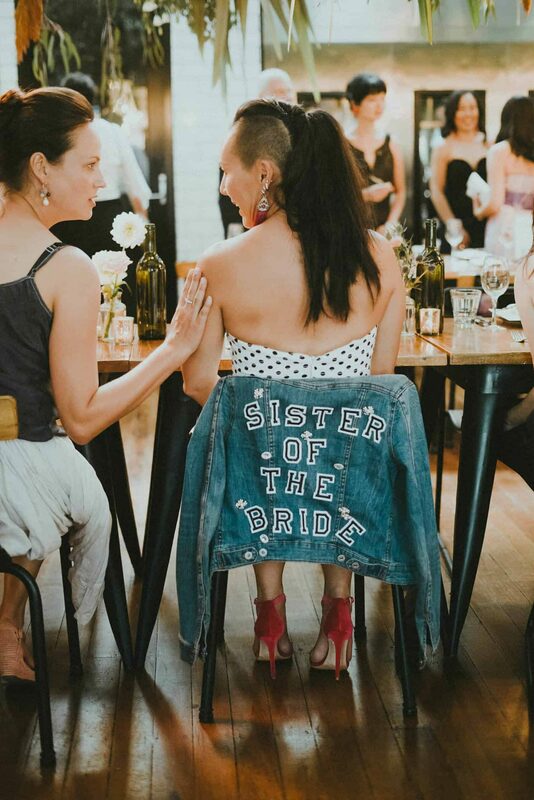 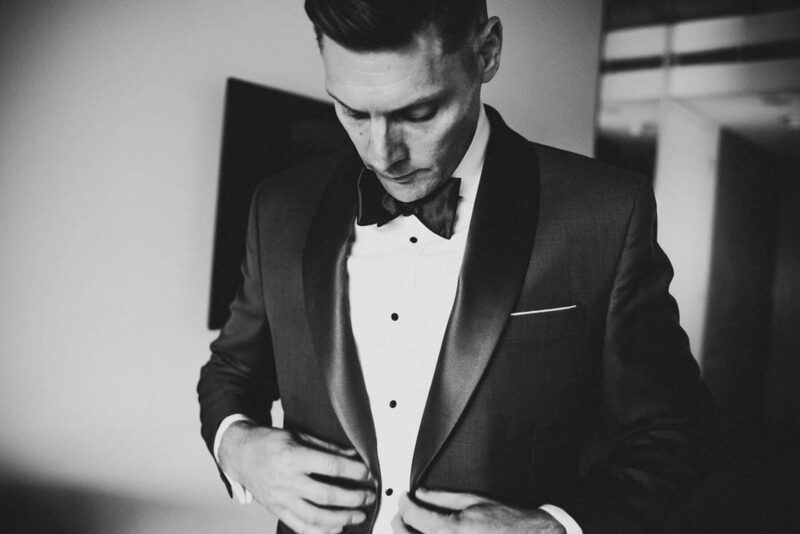 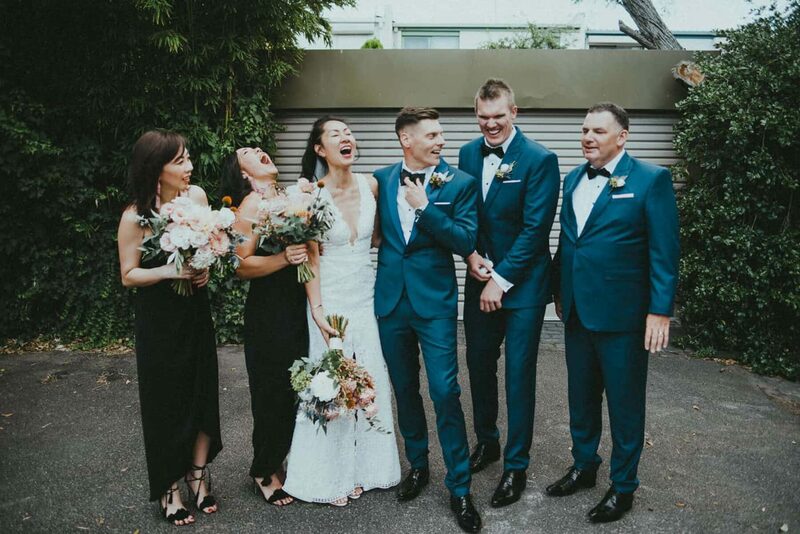 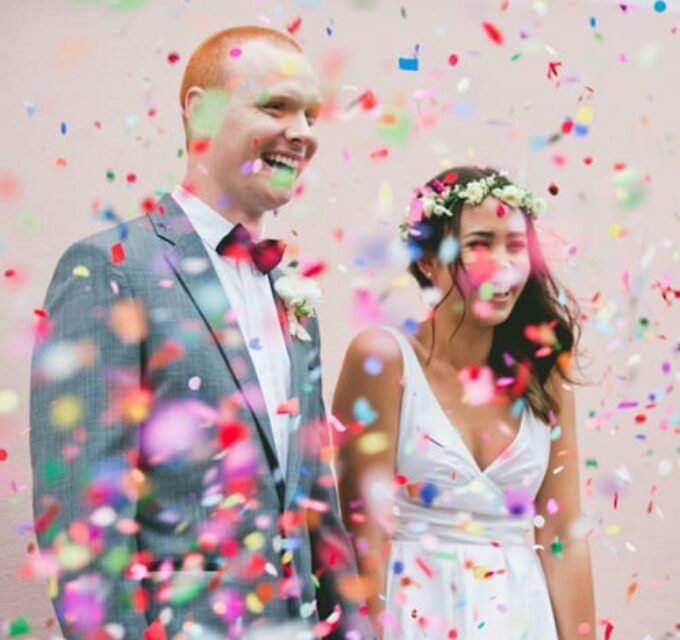 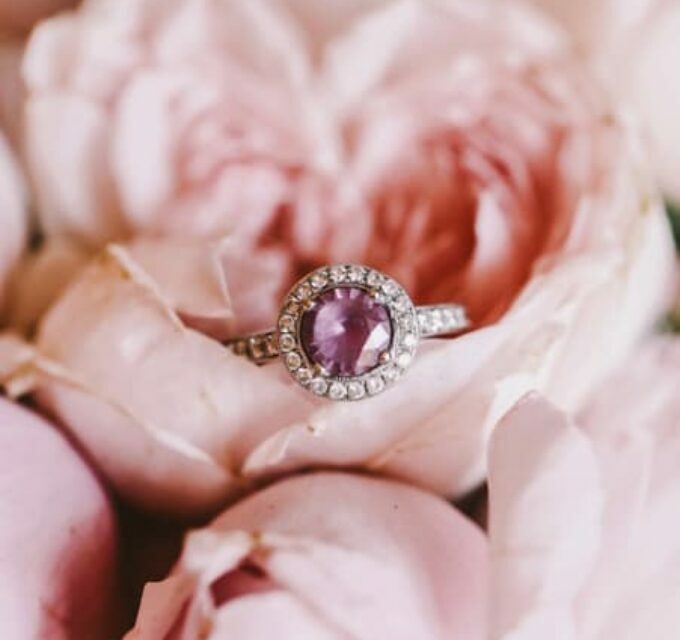 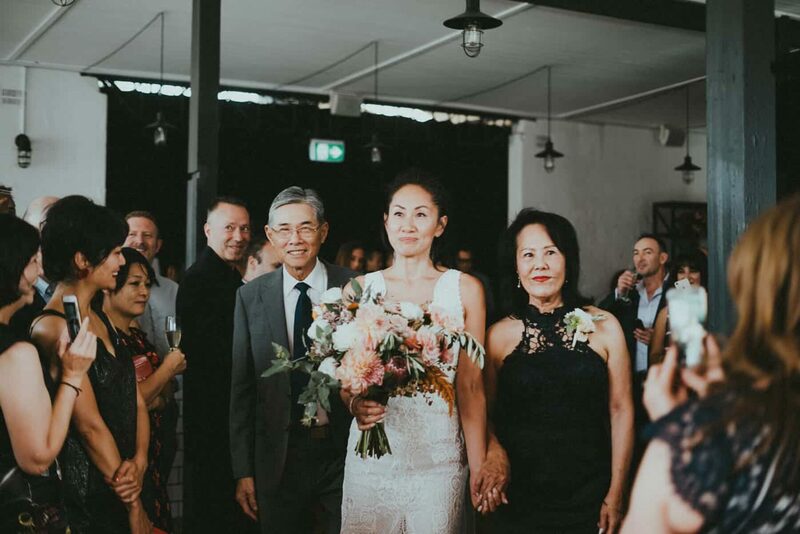 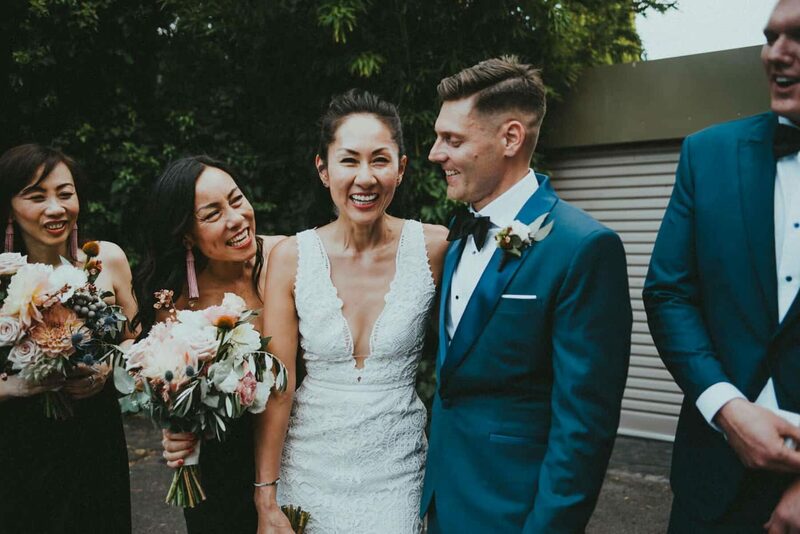 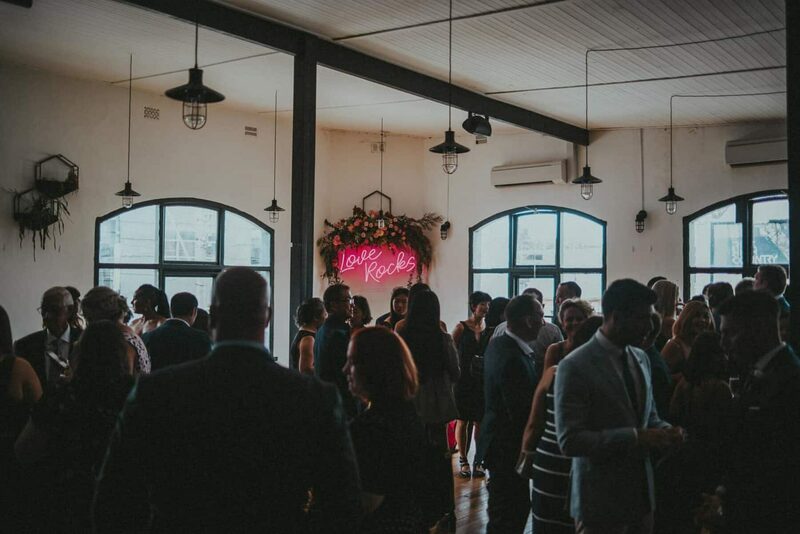 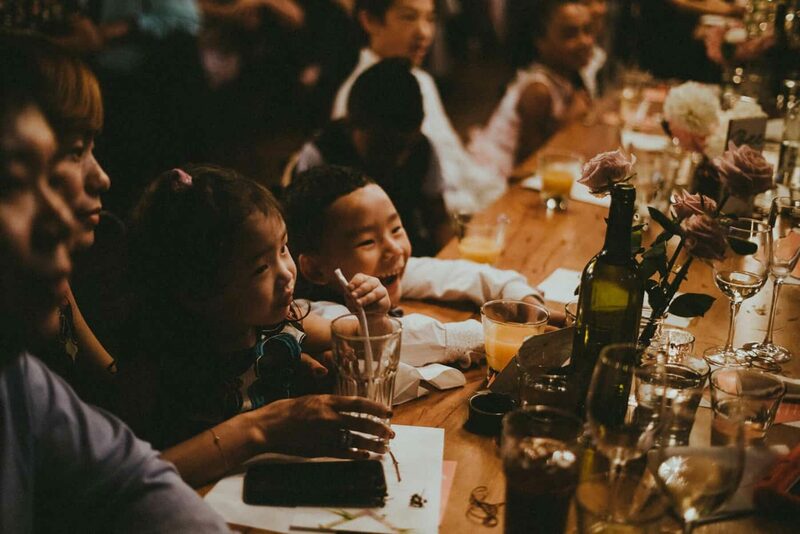 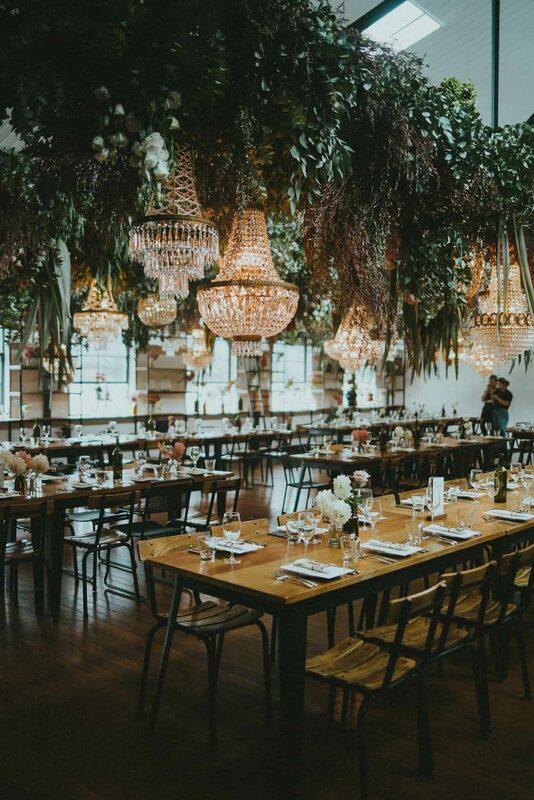 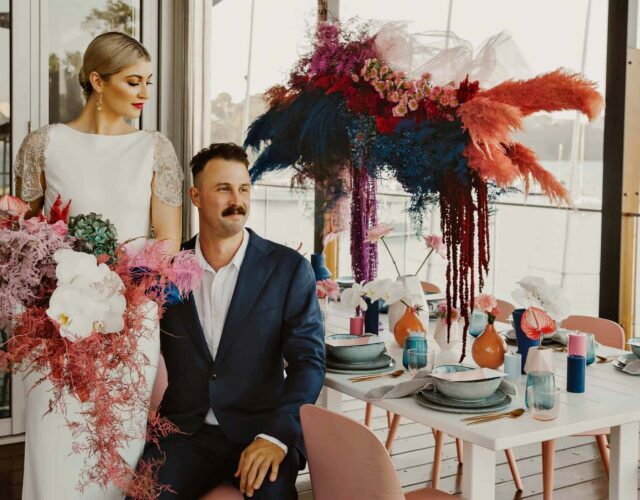 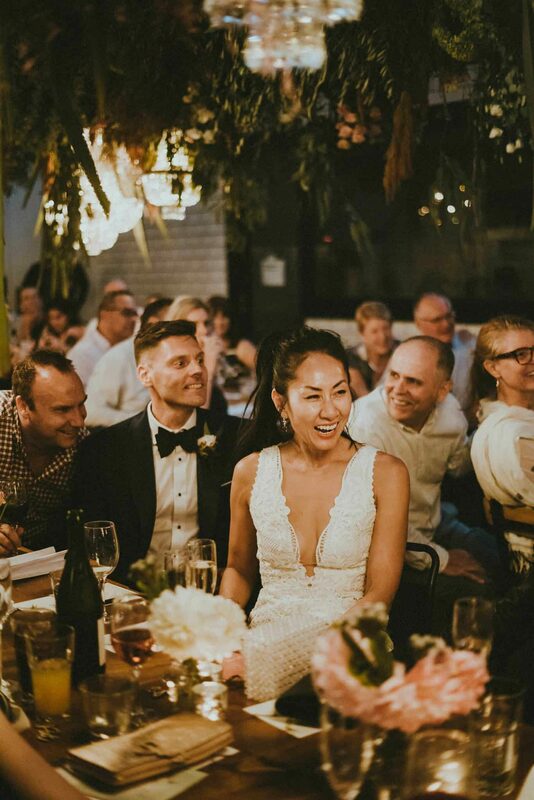 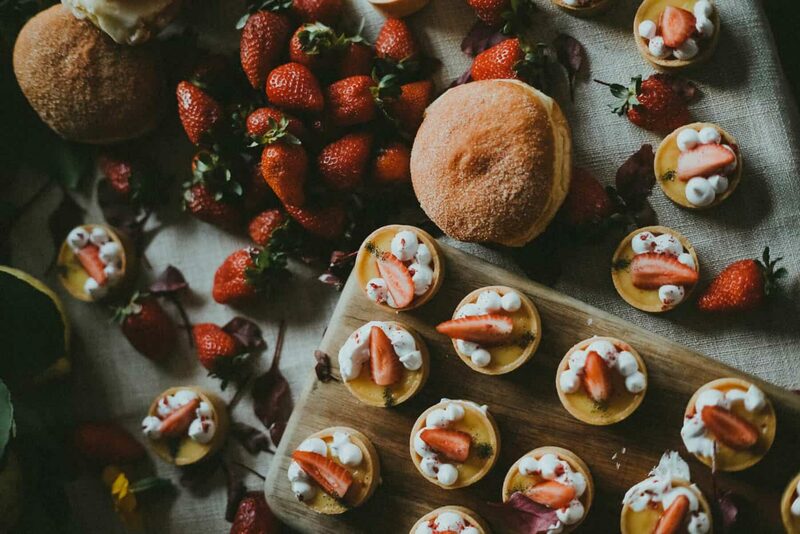 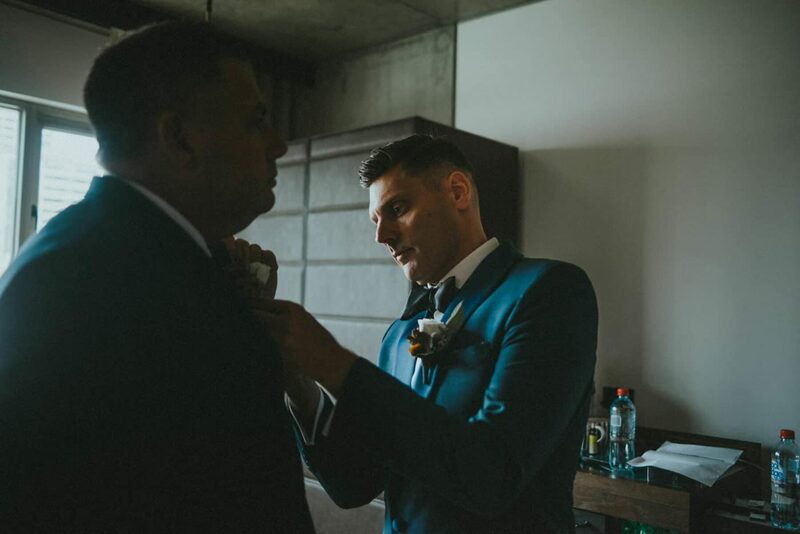 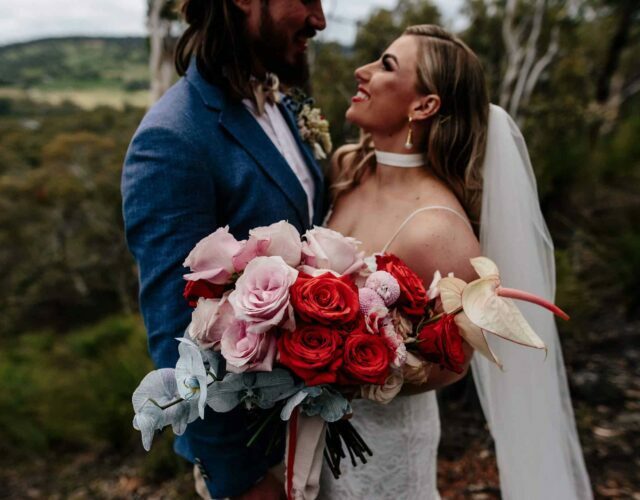 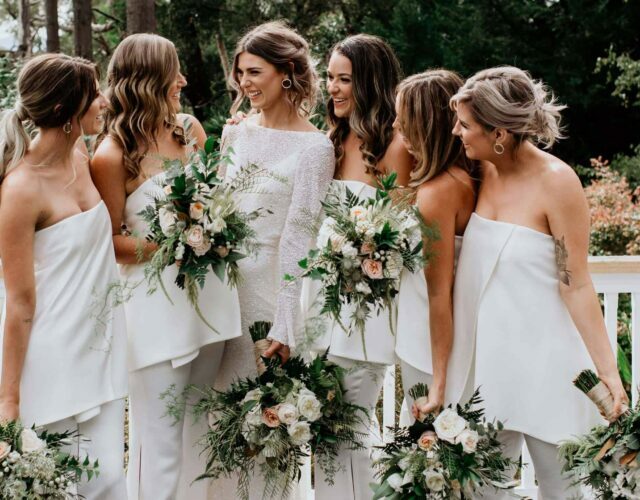 With lenswoman extraordinaire Tanya Volchanskaya behind the lens, and Melbourne faves Pomp & Splendour on the blooms, Tash and Pete’s chilled-out Collingwood warehouse wedding was destined for greatness. 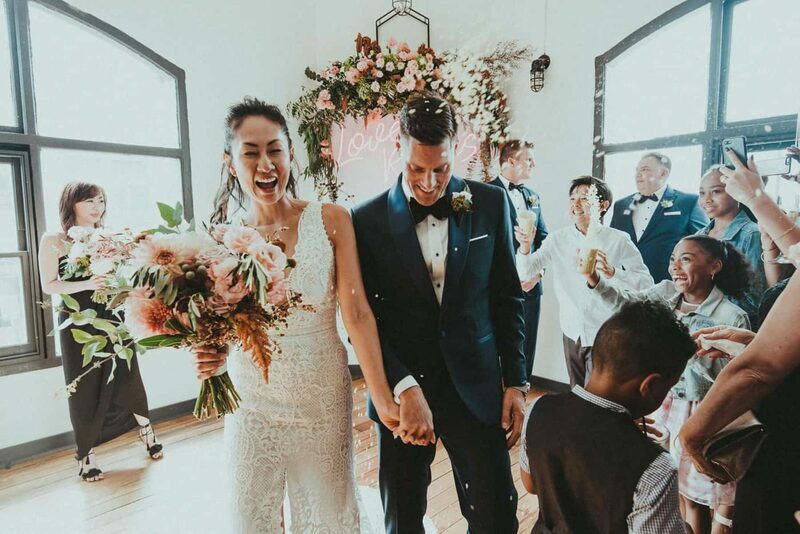 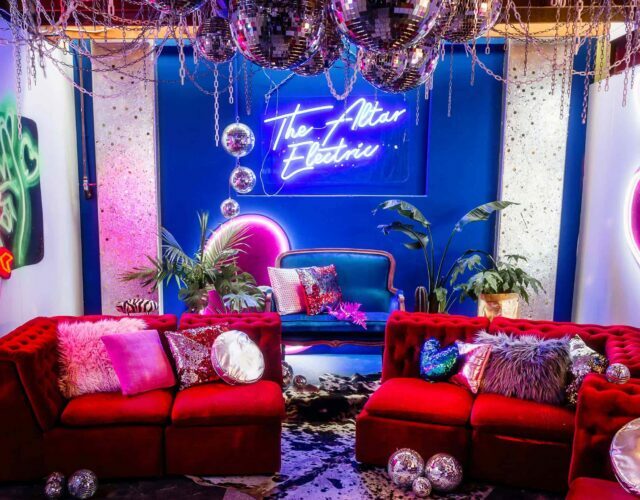 The creative duo played to their strengths to create a day that reflected their personal style and vision, with as much dancing as possible. 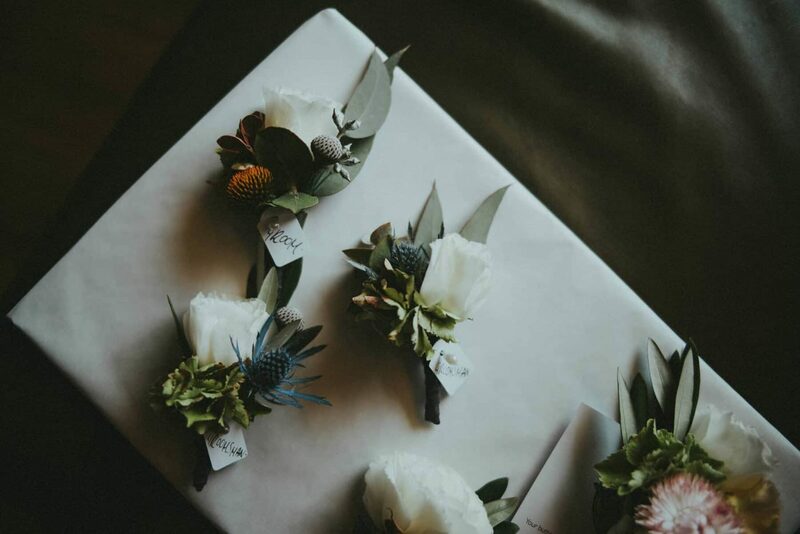 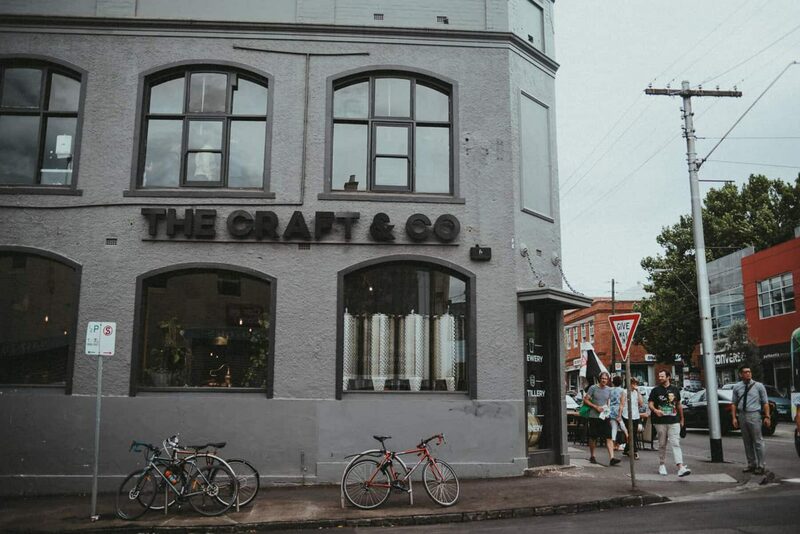 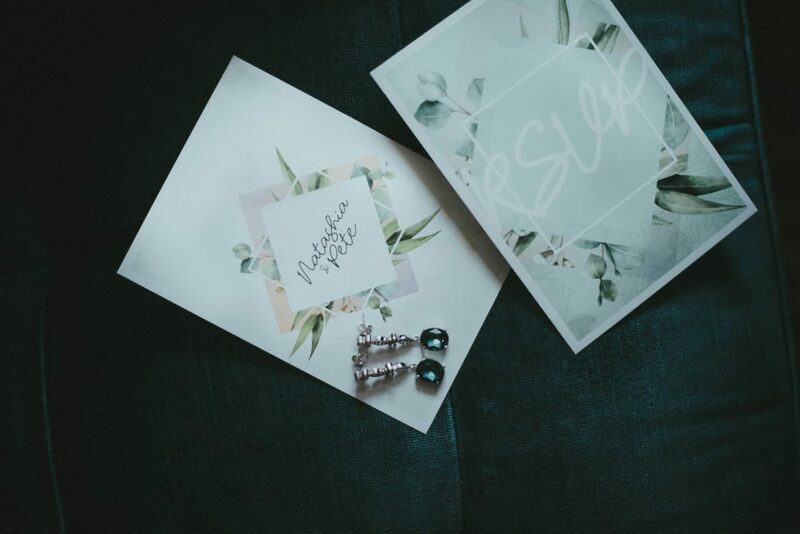 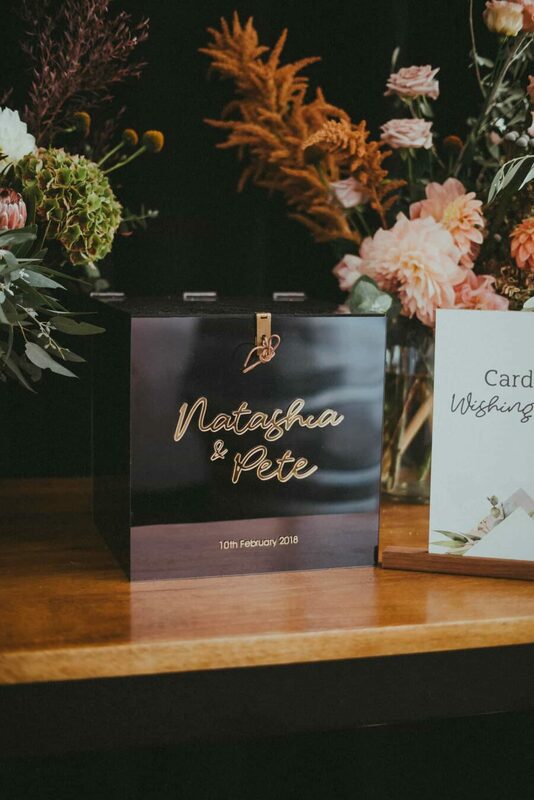 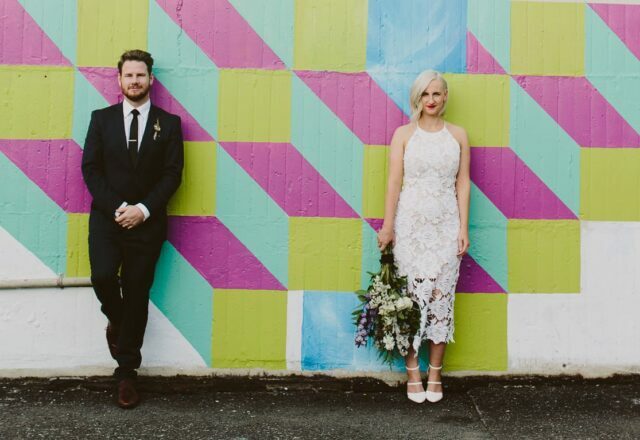 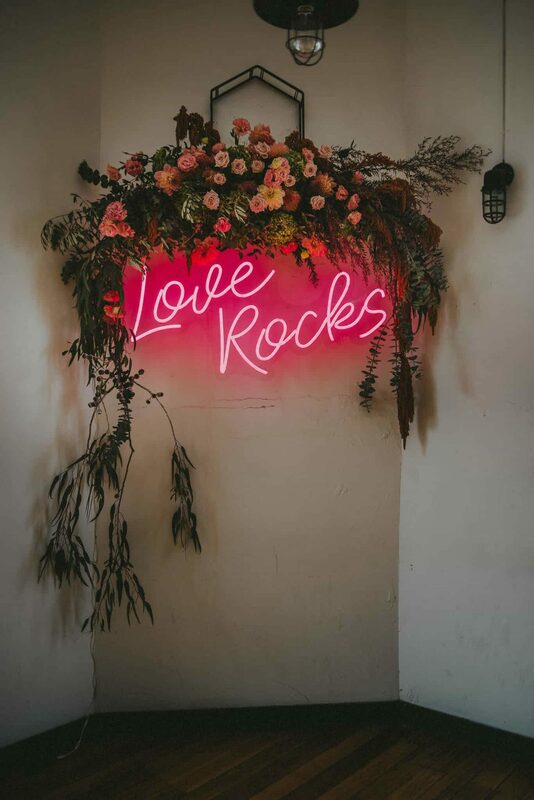 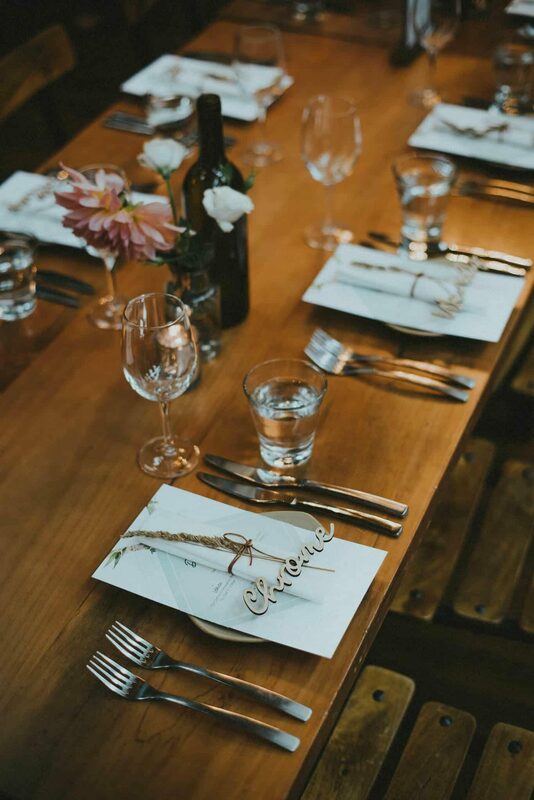 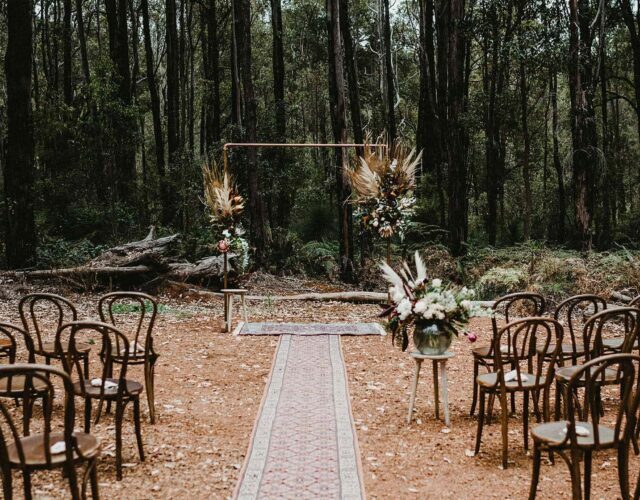 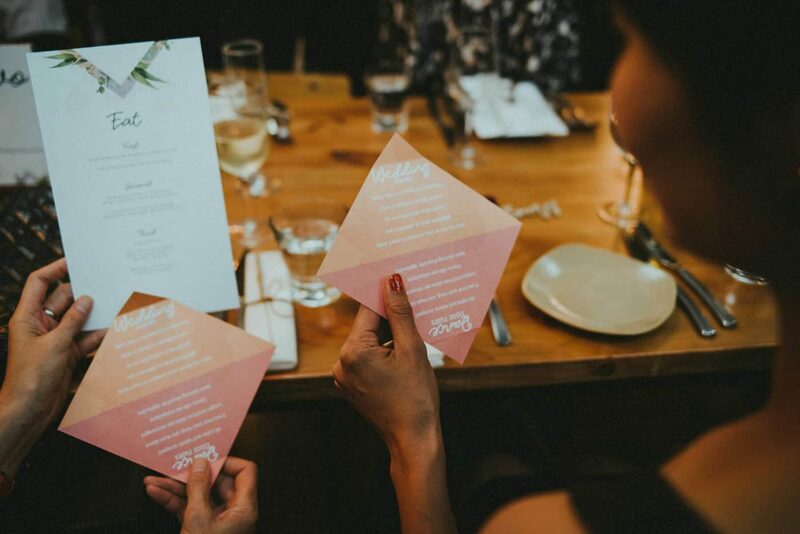 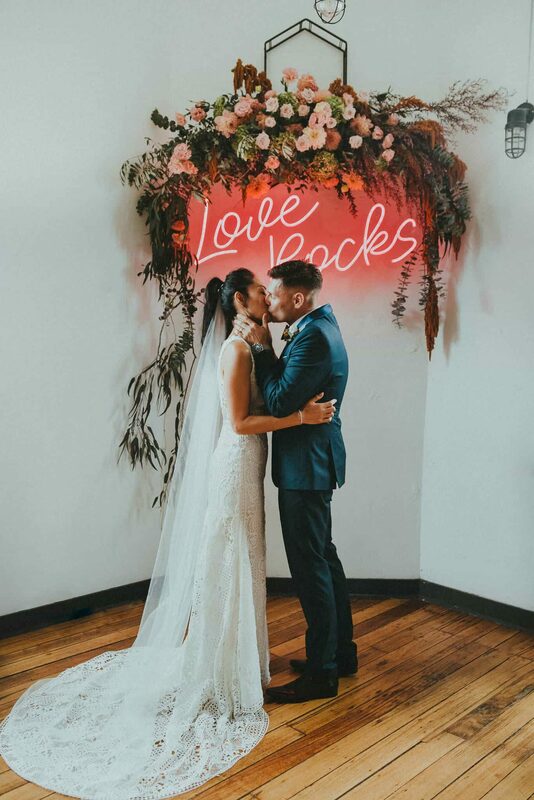 As Pete is a graphic designer and photographer, it was a natural decision that he would do the paper goods and signage, while Tanya worked with Pomp & Splendour to fill the space with swoon-worthy flowers and foliage. 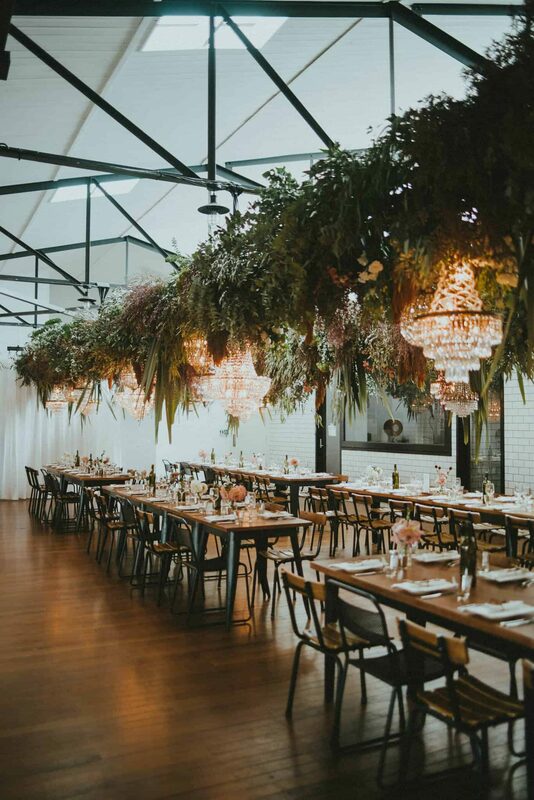 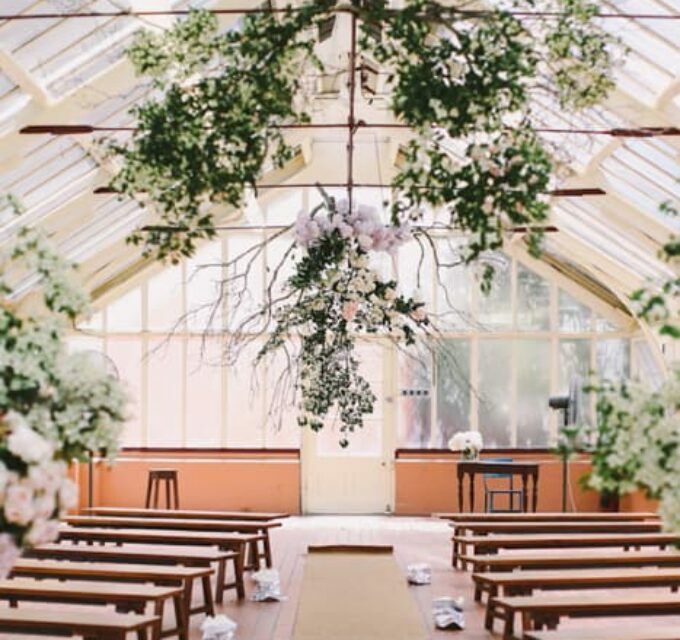 Taking full advantage of the lofty ceilings, masses of greenery and softly lit chandeliers were suspended, with stunning results. 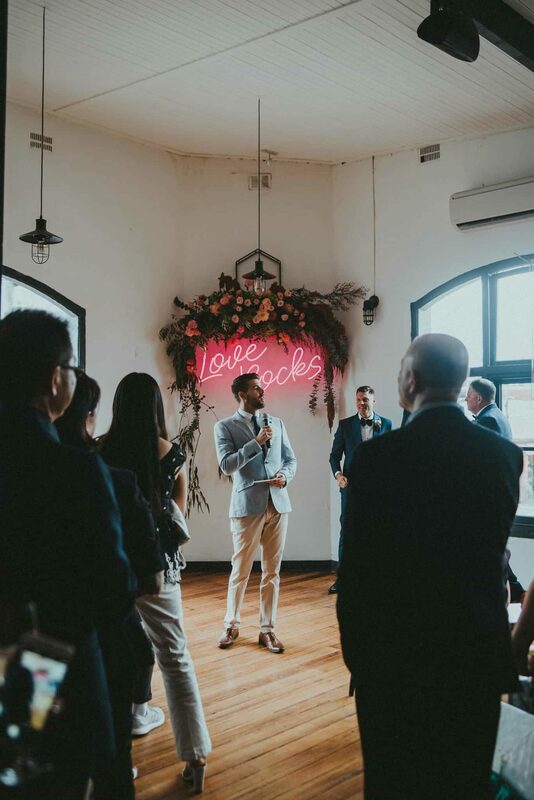 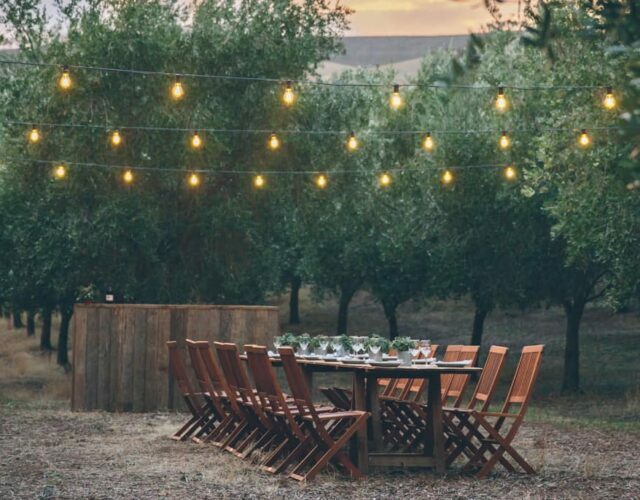 With a strong sustainable ethos, the Pomp team took the utmost care to keep their floral footprint small by forgoing the use of toxic floral foam, composting green waste (after removing all plastic cable ties) and salvaging the timber lattice structures. 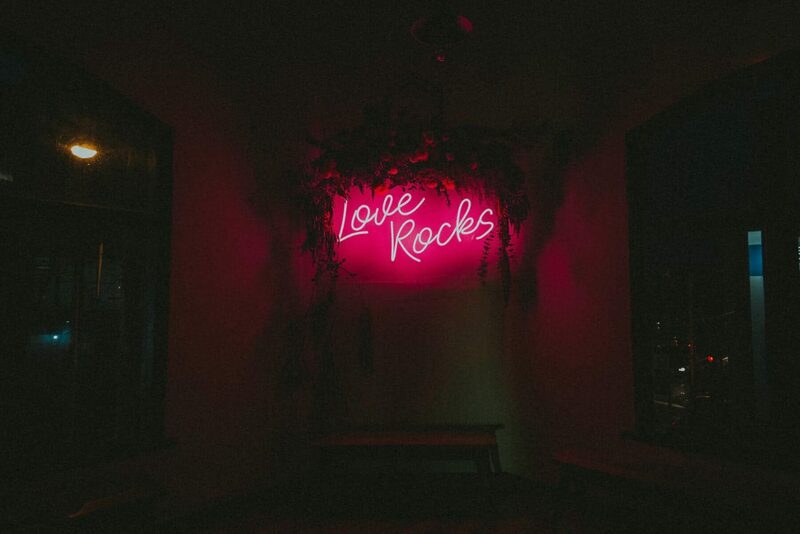 Kudos. 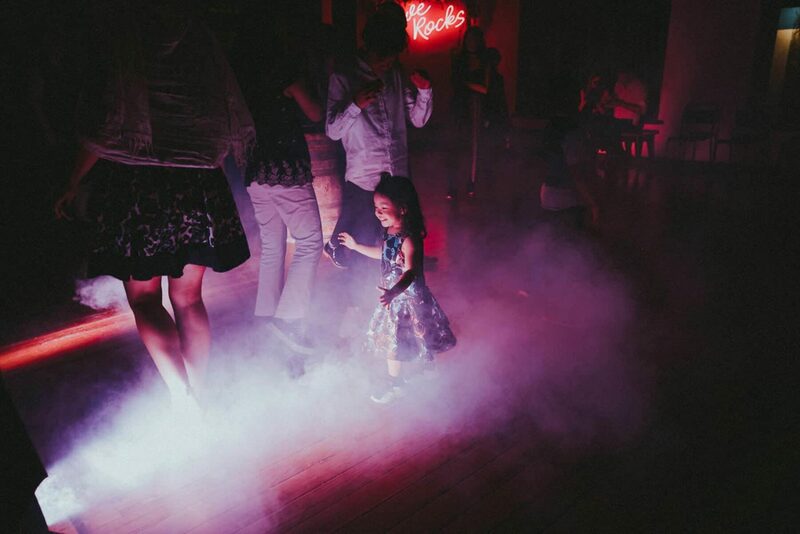 With plenty of dancefloor action on the agenda, a good sugar high was a necessity. 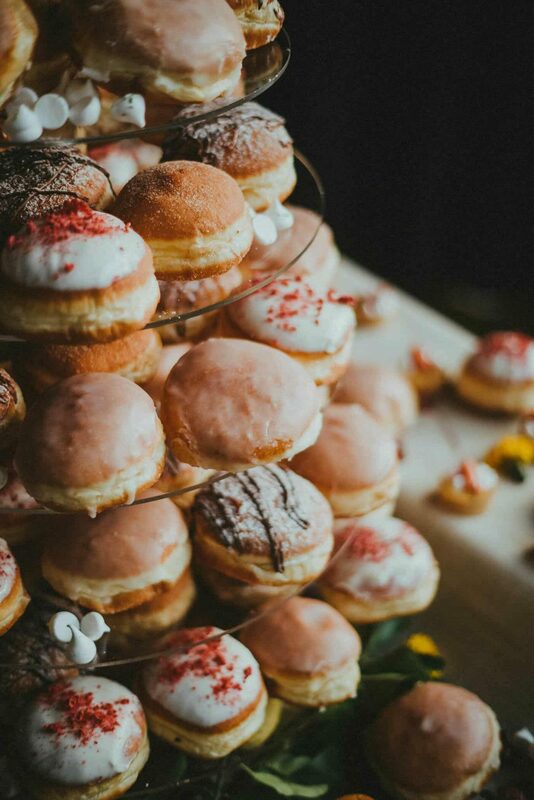 In lieu of a traditional wedding cake, the couple opted for an epic donut tower from Daniel’s Donuts, the crowning glory of the dessert table. 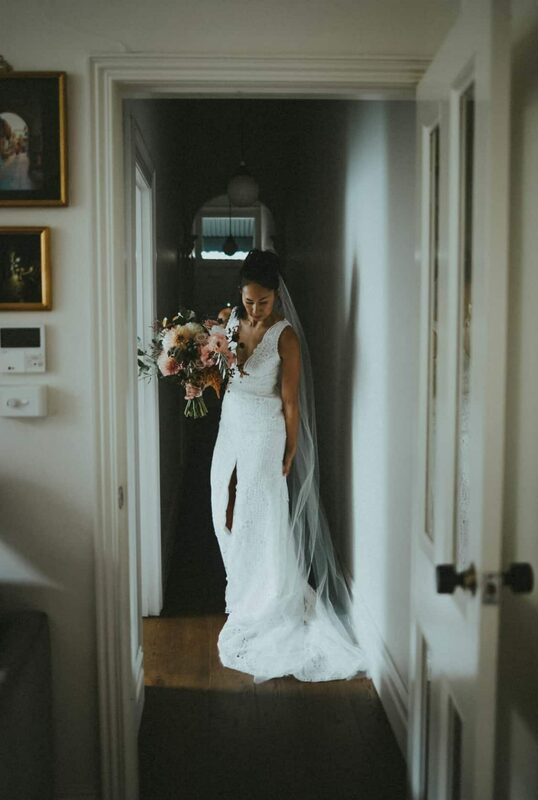 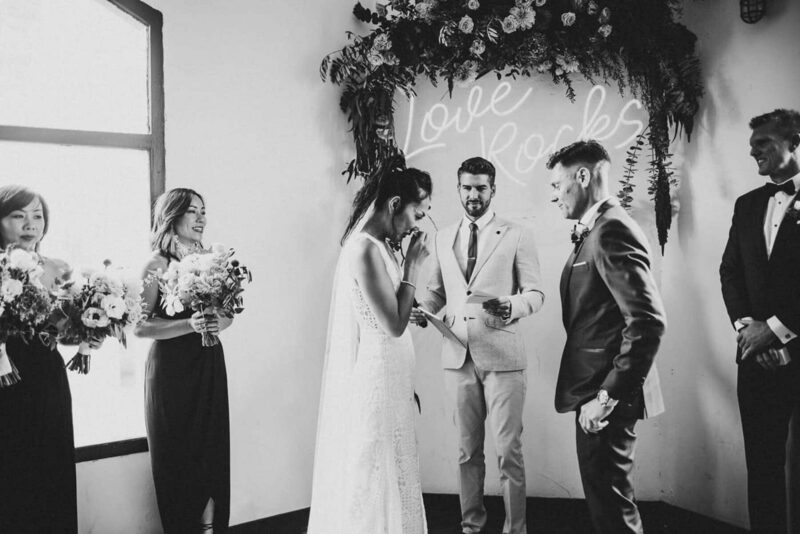 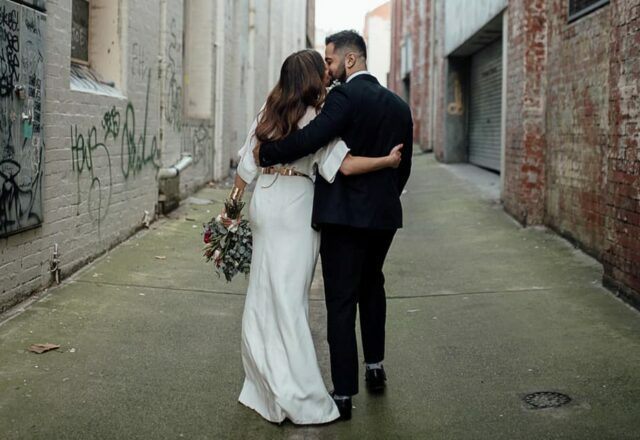 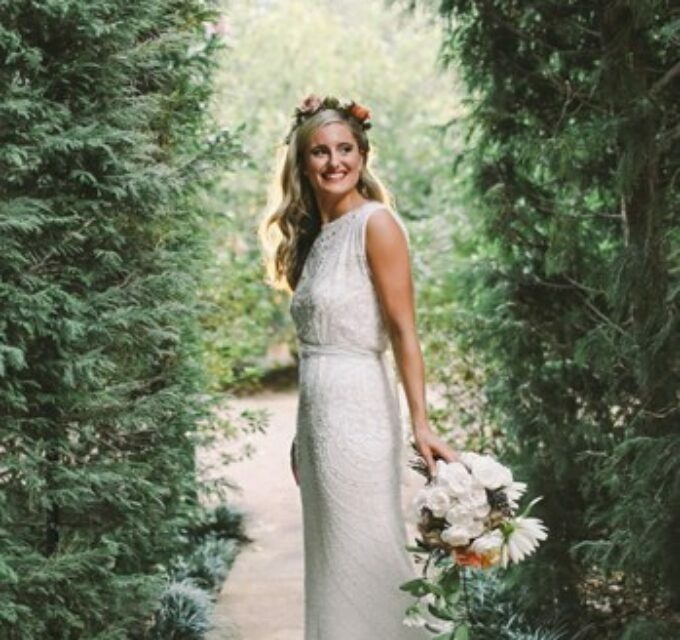 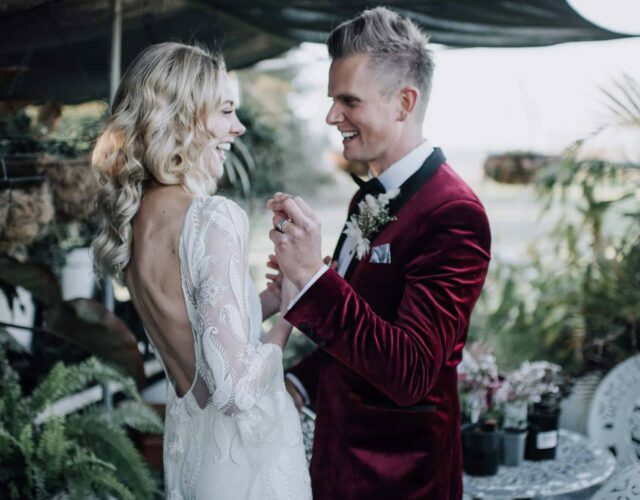 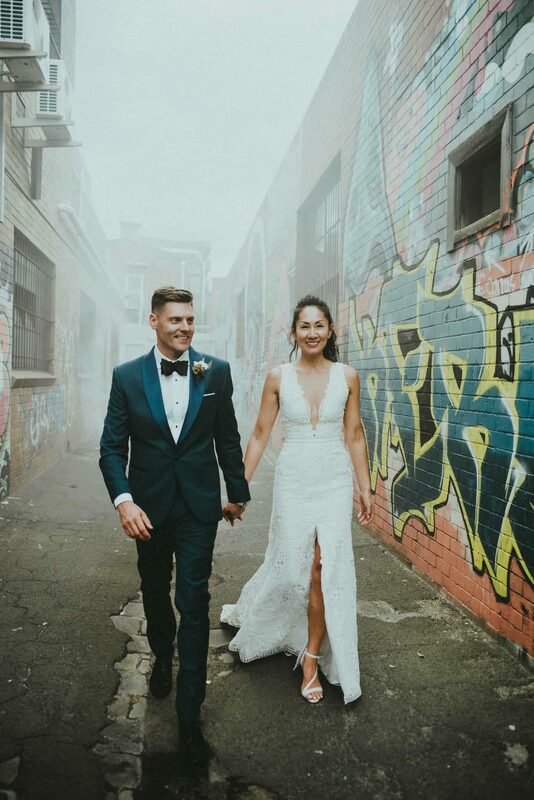 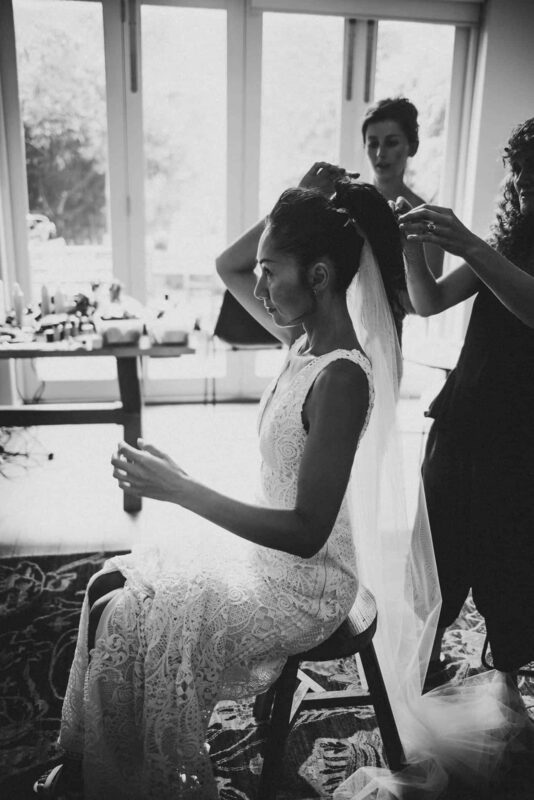 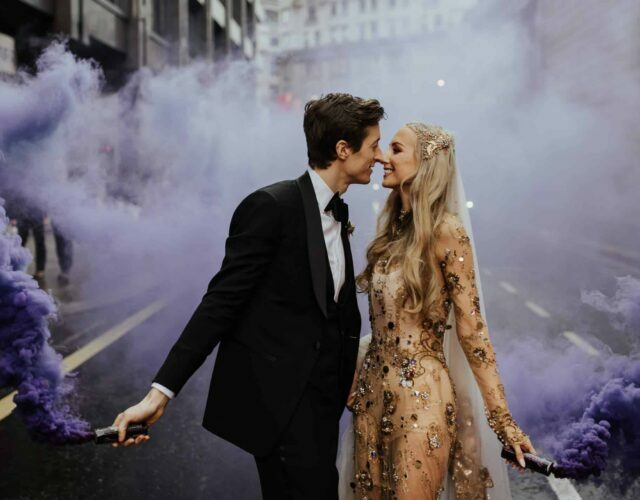 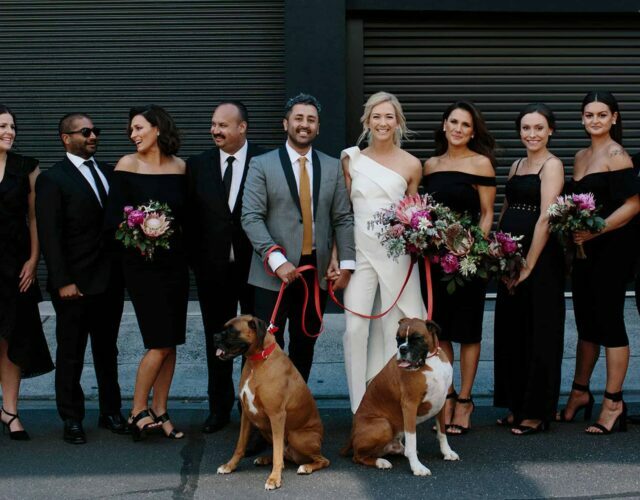 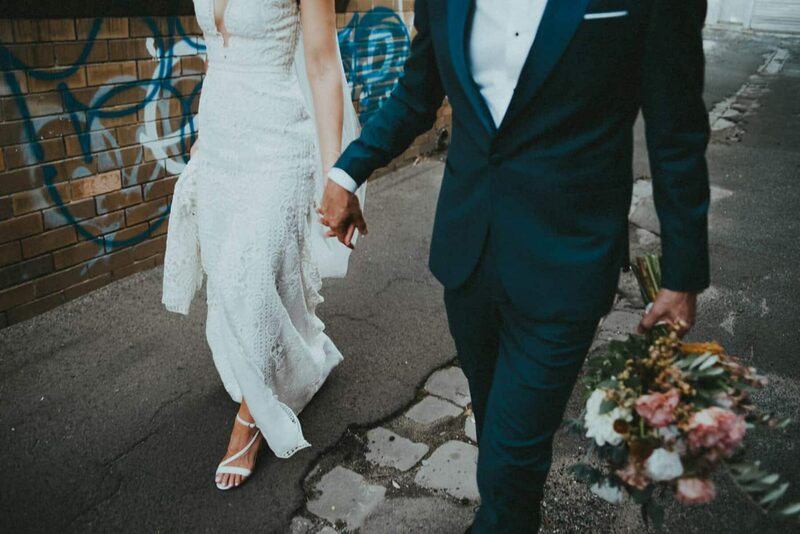 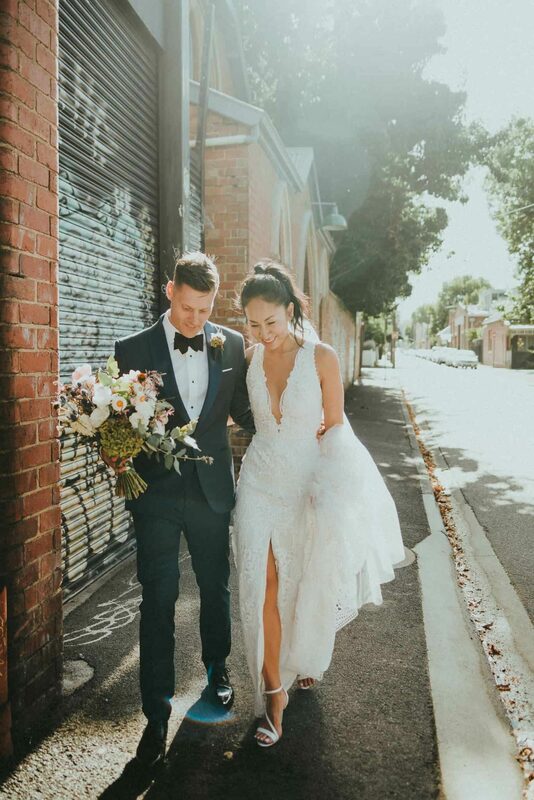 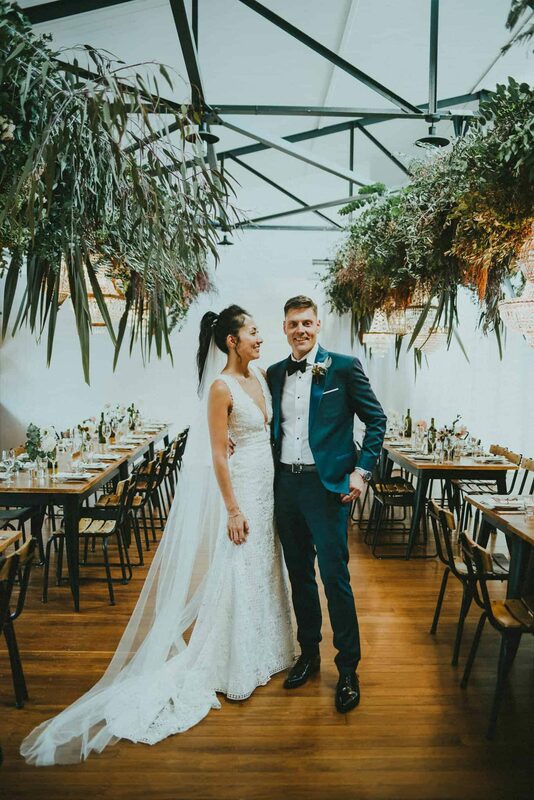 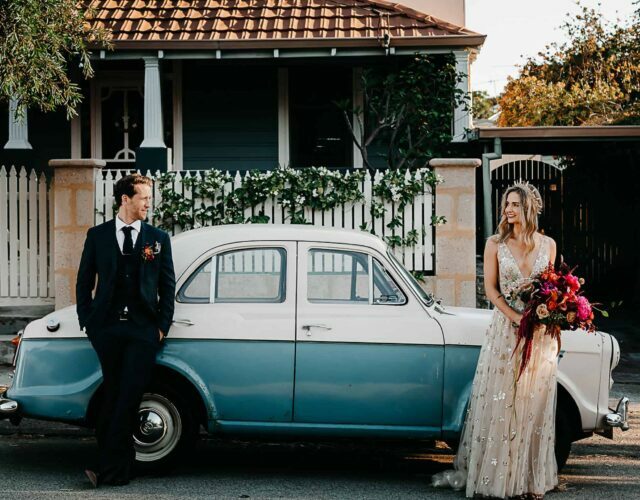 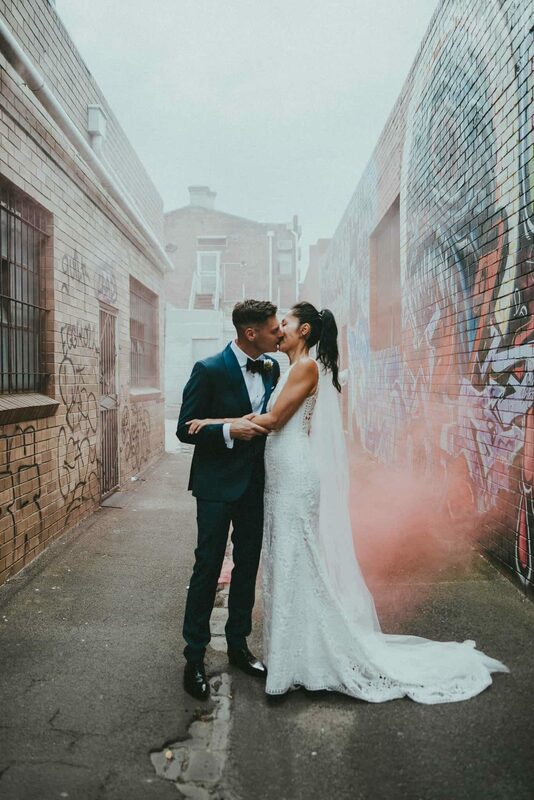 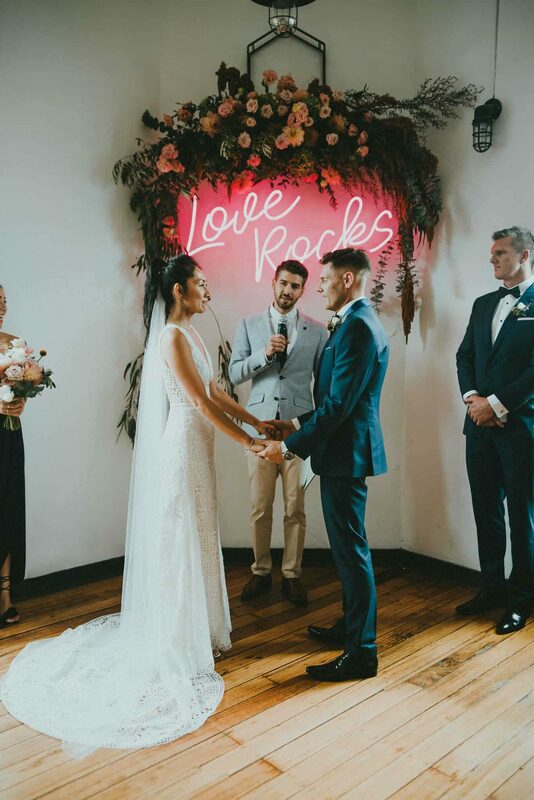 Tash wore a classic yet modern Suzanne Harward dress, with lace details and a dramatic floor length veil – the perfect look for an urban warehouse wedding. 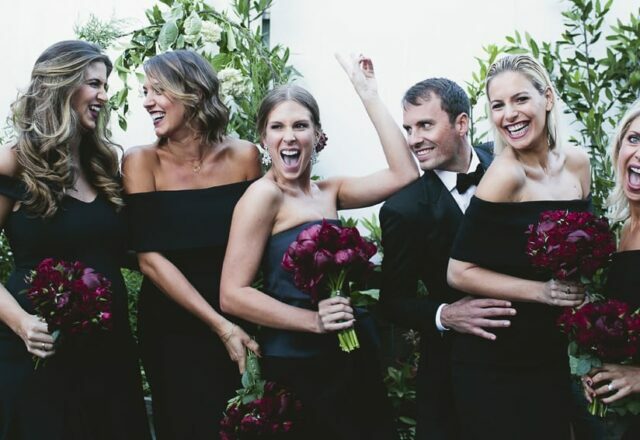 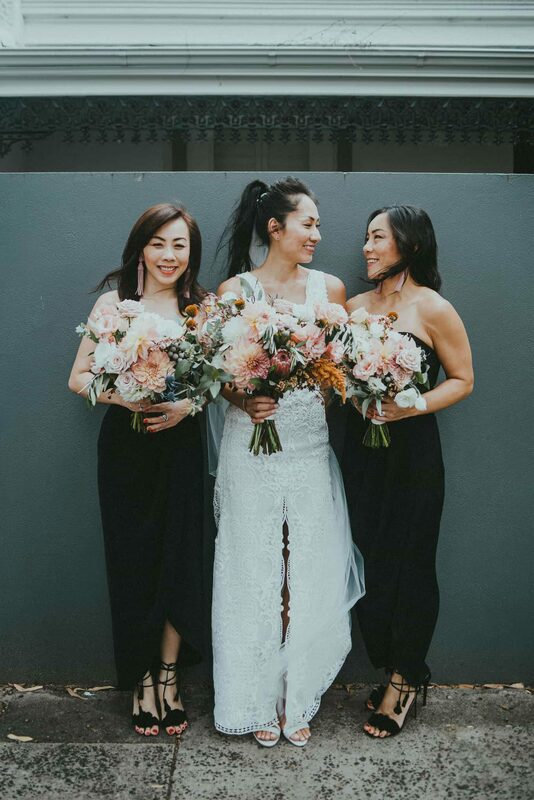 Tash’s bridesmaids kept things modern and stylish in black strapless Shona Joy dresses. 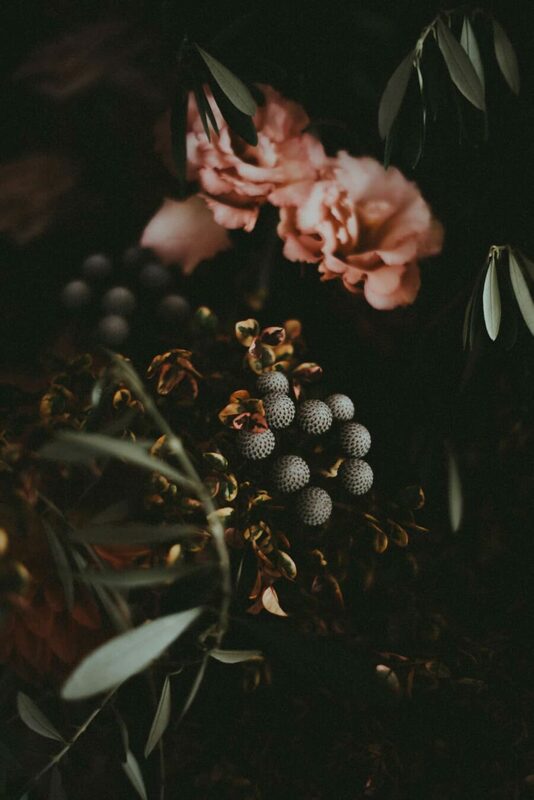 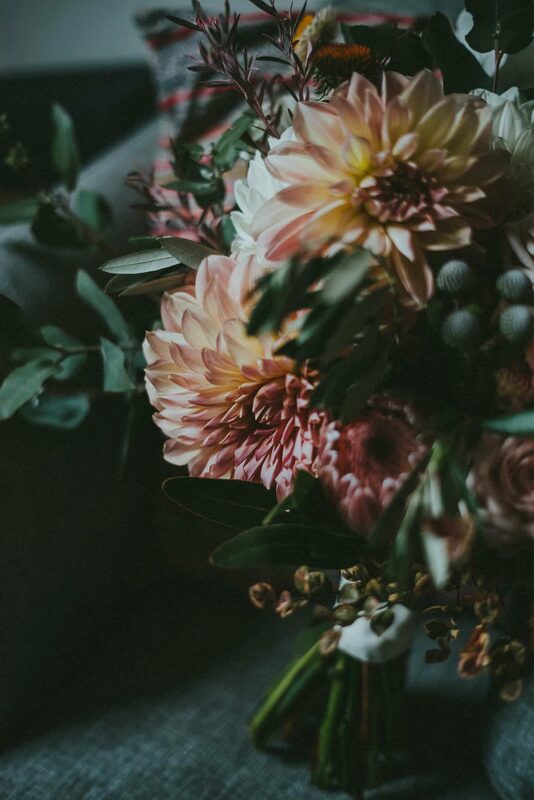 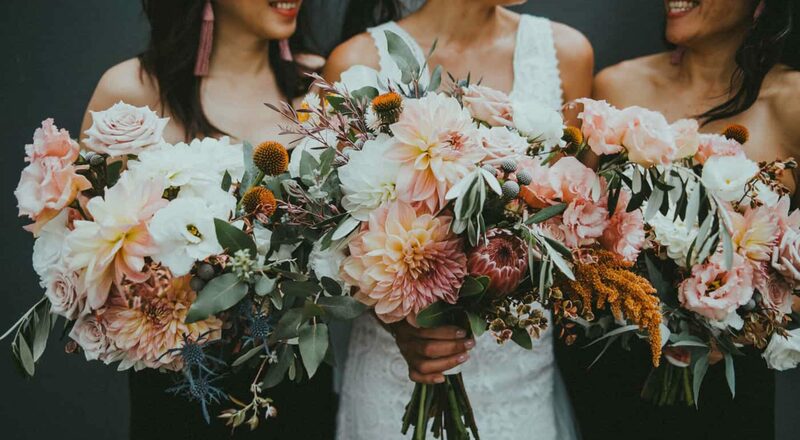 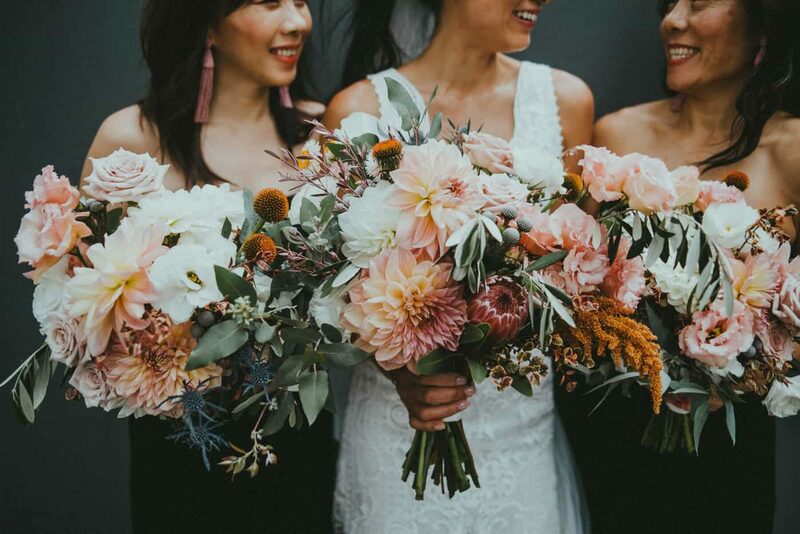 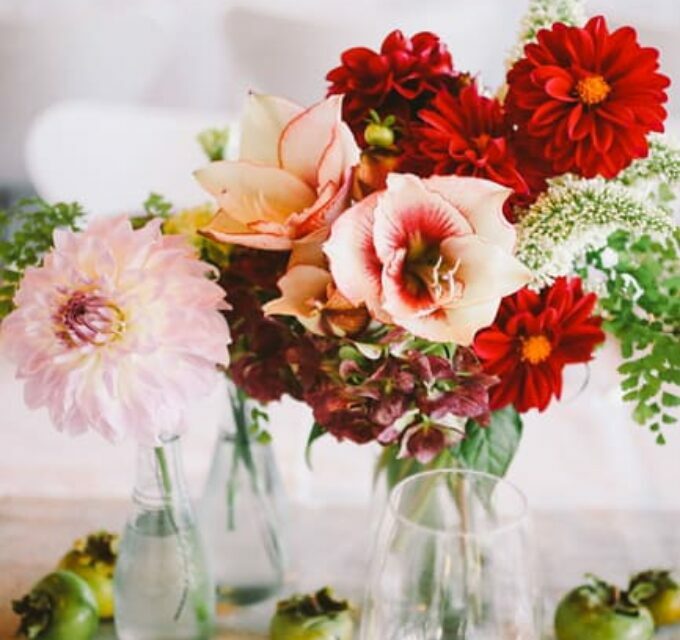 Pomp & Splendour crafted gorgeous bouquets for the girls, featuring loads of blush pink dahlias and proteas with sage-toned greenery. 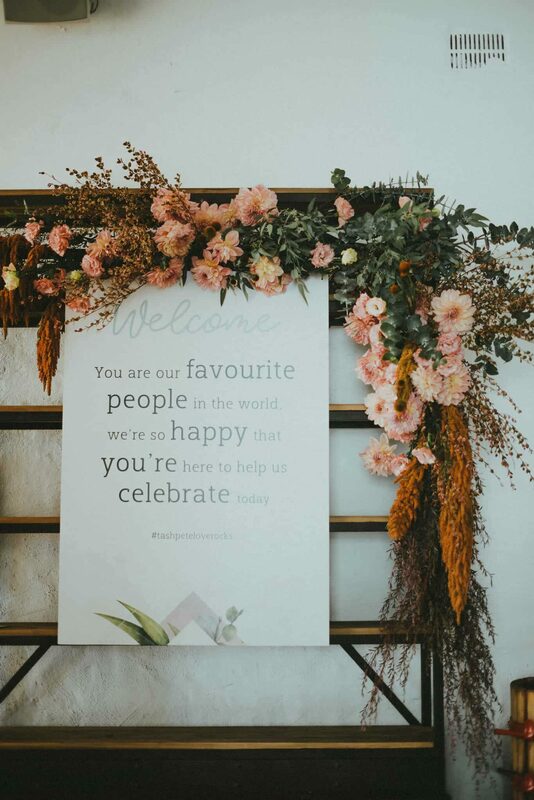 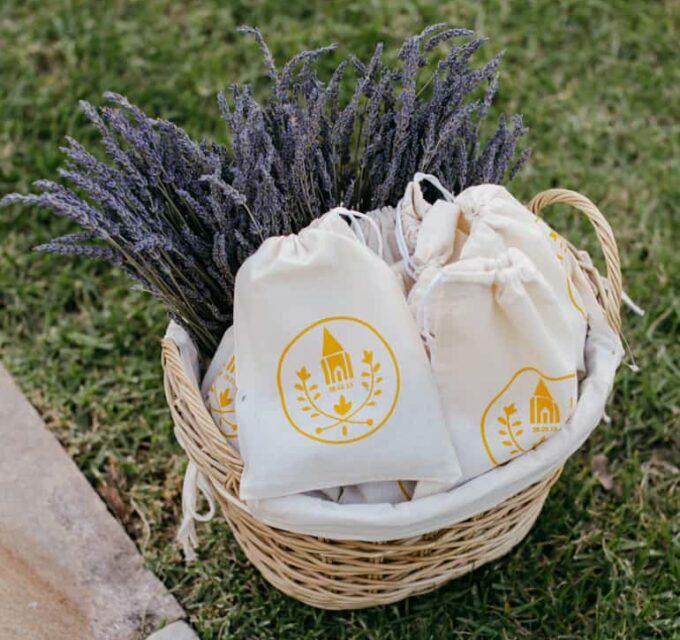 The Pomp & Splendour team worked their magic adorning the venue with dramatic hanging botanic installations, going the extra mile to reduce their footprint but avoiding floral foam and composting all green waste. 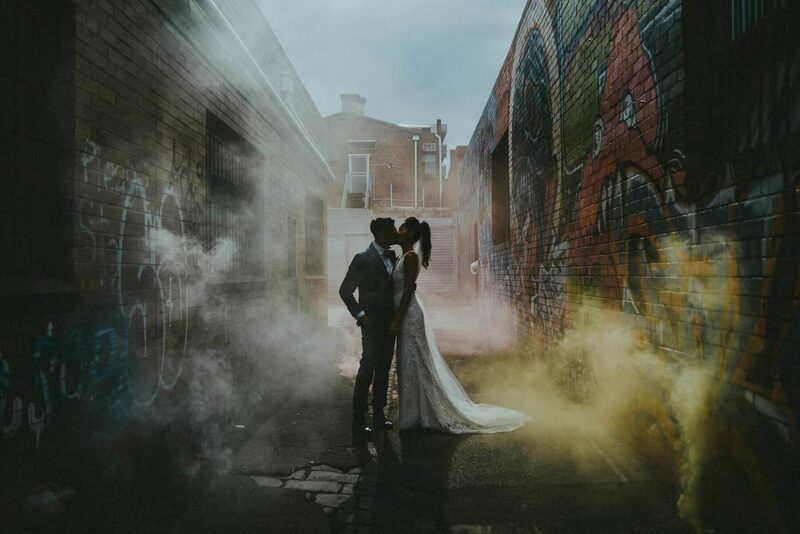 With a moody and free-spirited vibe, Tanya Voltchanskaya’s non-traditional photographic style captured all the sweet, candid snaps, plus these fun laneways portraits with smoke bombs from Coloured Smoke Australia. 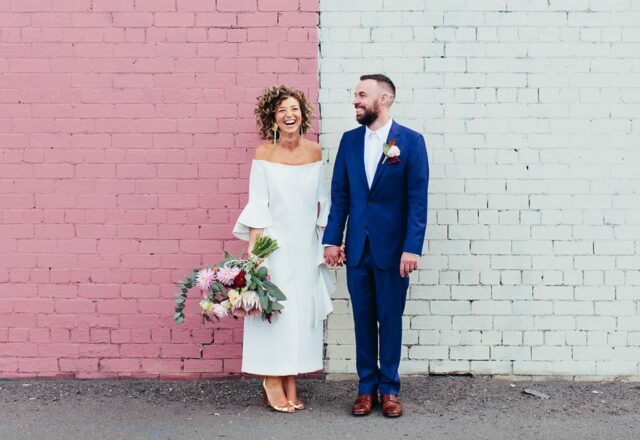 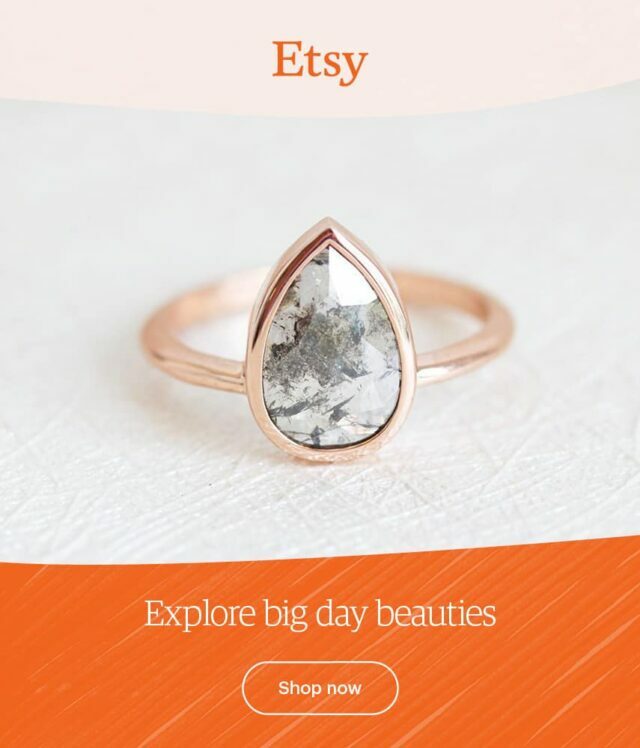 Donut or wedding cake, that is the question and a pretty tough one at that! 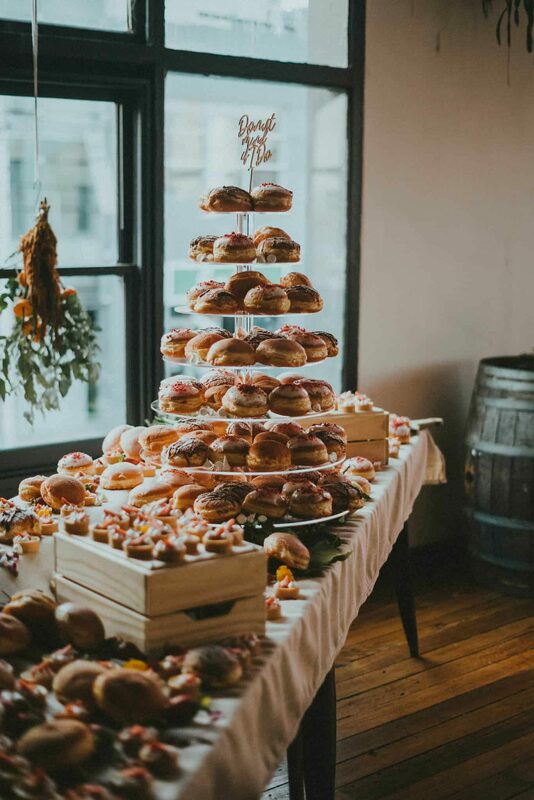 We'd be pretty chuffed to tuck into this towering delight by Daniel's Donuts.